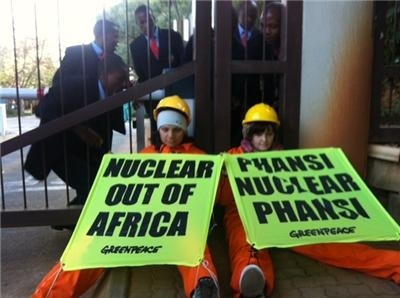 Greenpeace activists protested outside a pro-nuclear conference in Sandton, where South Africa’s Deputy President and the Minister of Energy were due to talk. In an early morning protest, Greenpeace activists blockaded the entrance to the conference venue with hundreds of black nuclear bags and yellow nuclear drums. 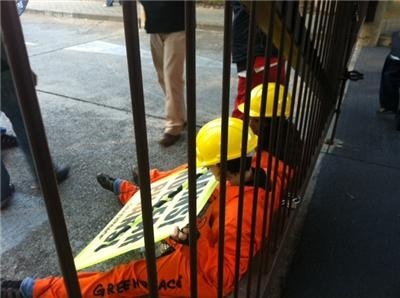 Five activists also chained themselves to entrance gates in an attempt to stop the exclusive pro-nuclear talks from going ahead. 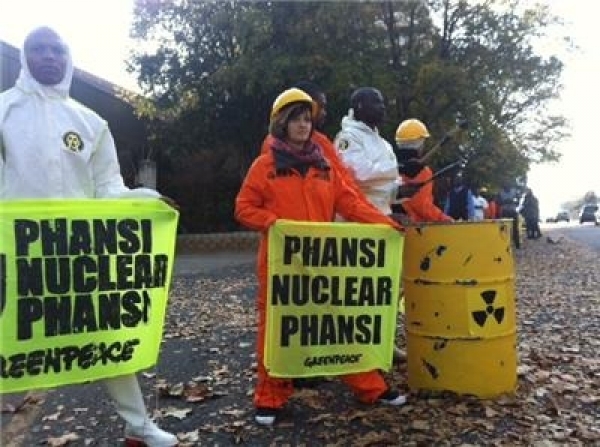 Greenpeace protested because, although nuclear power is still being hotly debated and is far from being approved in South Africa, our leaders are proceeding as if nuclear was a done deal. Rather than embracing a safe and sustainable future of abundant employment and reliable renewable energy, they are focusing on prohibitively expensive nuclear power, and jeopardising our future in the process. 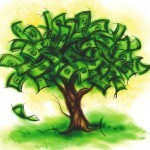 Nuclear energy is very expensive and prone to construction delays, which mean even more costs for tax payers. In Finland, for example, project delays have resulted in costs ballooning by almost 100%, from EUR3.2billion to EUR6billion. Even France, one of the strongest proponents of nuclear energy, is no stranger to ballooning costs and long delays. A new reactor in Flamanville has been constantly plagued by construction issues and budget over-runs since the project began. “Energy Minister Peters’ support to expand nuclear power in Africa is extremely irresponsible given the socio-economic challenges prevalent on the continent” said Greenpeace Africa climate and energy campaigner Ferrial Adam. “As a continent we should be learning from what history has shown about nuclear power: it is a dirty and dangerous source of energy, and one that will always be vulnerable to the deadly combination of human errors, design failures, and natural disasters,” added Adam. In South Africa, the nuclear process to date has been far from transparent. Key questions around the design, cost and safety of the proposed nuclear build are stilll unanswered. “The government’s dream of becoming a nuclear power will end up being a nuclear nightmare and should be stopped now before it’s too late” warned Adam. In place of conferences seeking to promote outdated nuclear technology in Africa, we should be seeing talks focusing on how renewable energy can create energy security, empower local communities, and combat climate change. 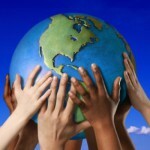 What’s the Alternative to nuclear power? Greenpeace’s Energy [R]evolution is a practical blueprint for how South Africa can meet its energy demands entirely by investing in reliable renewable energy and by increasing energy efficiency – nuclear power is completely unnecessary. Going this route would avoid nuclear hazards and allow us to meet our greenhouse gas reduction targets. It would also improve our energy security, keep energy costs down, and generate hundreds of thousands of sustainable, quality jobs.